Left to right: Charles "Andy" Anderson, Ty Wessell, Richard Wiggins (architect for Daverman Associates, the building contractors), Bob Sneden, Cliff Wonders, Robert Schmiedicke. 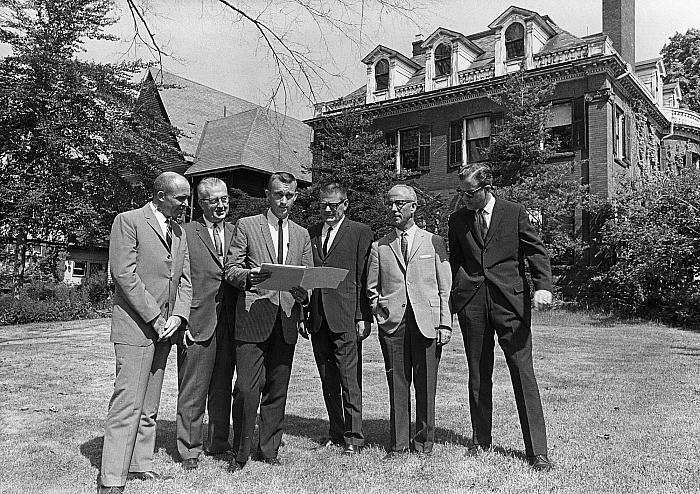 Davenport President Robert Sneden, fourth from the left, confers with other school officials in front of two houses on the north side of E. Fulton St., in the 400 block. The group examines plans for a new academic building. The home behind the group was originally the Howard home at 439 E. Fulton; the one less visible, to the left, was the Gorham home at 433 E. Fulton. Title by cataloger. The two homes pictured here were demolished soon after this photo was taken in order to make way for Davenport's academic center, which now belongs to the Grand Rapids Community College, and can be seen in the aerial view of the campus. Coll. #46-22B-1, History & Special Collections Dept.